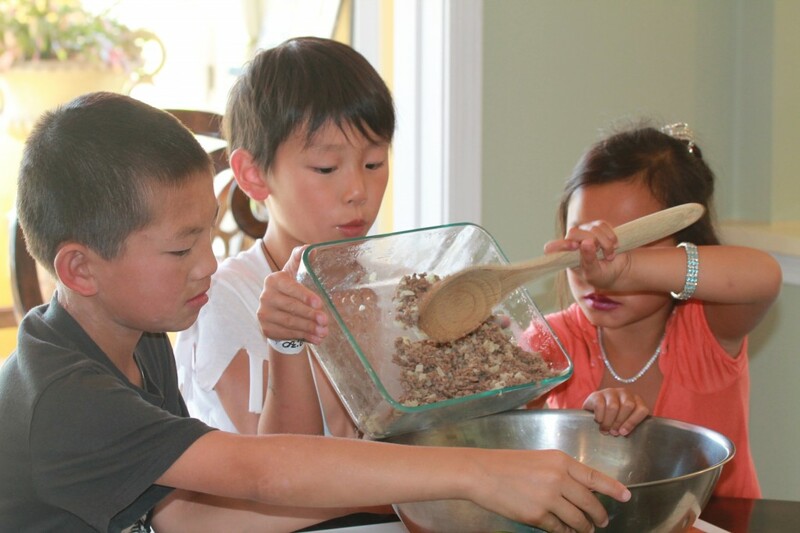 Depending on the age of the child preparing this dish, the ground beef and onions, as well as the rice, may be made in advance, and cooled down leaving the mixing, stirring, and stuffing to the children. While I may be somewhat over-cautious with my grandson the J-Dude regarding tasks cooked on the range, still, over time he has shown to be responsible so I just carefully supervise the process such as scraping the chopped onions or ground beef into the pan, and intermittently stirring the ingredients. 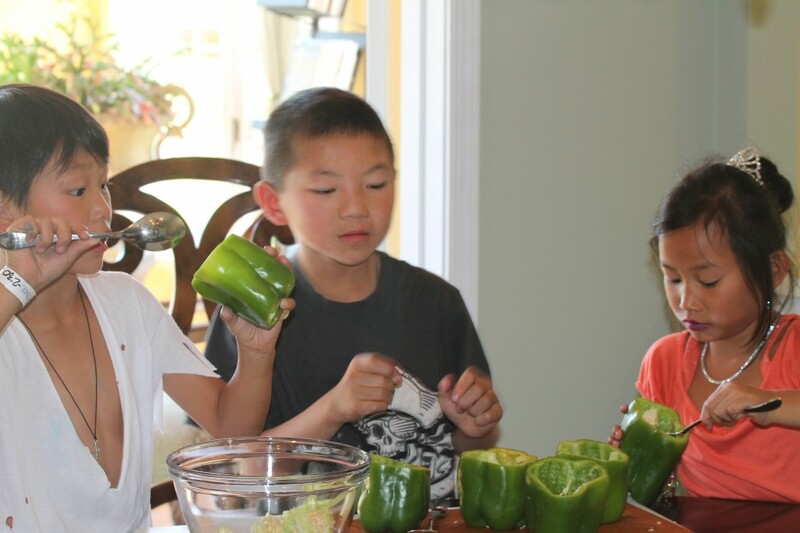 Preparing traditional Stuffed Peppers with kids also provides for using a limited number of ingredients making the steps easy to complete in between other activities or play time. 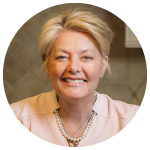 Learning these responsible tasks also takes on other learning dimensions, such as the importance of cleanliness and hand washing before and after touching foods. 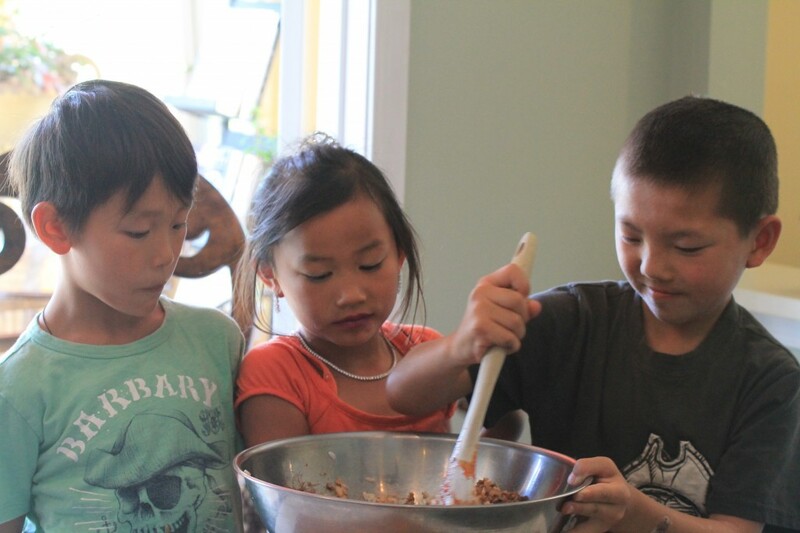 It’s a great group project too fostering team work as each child takes responsibility for designated tasks throughout the steps of preparation. Now the J-Dude doesn’t normally wear cut up tee shirts as displayed in the photos and the little girl from the neighborhood doesn’t typically wear tiara’s (well, OK, sometimes she does) but this day was Pirate and Princess day at camp, and so, parts of the costumes still remained. I admit it, as soon as I realized I was photographing portions of the pirate get-up resembling a muscle look from the Jersey shore, I immediately changed out the shirt. 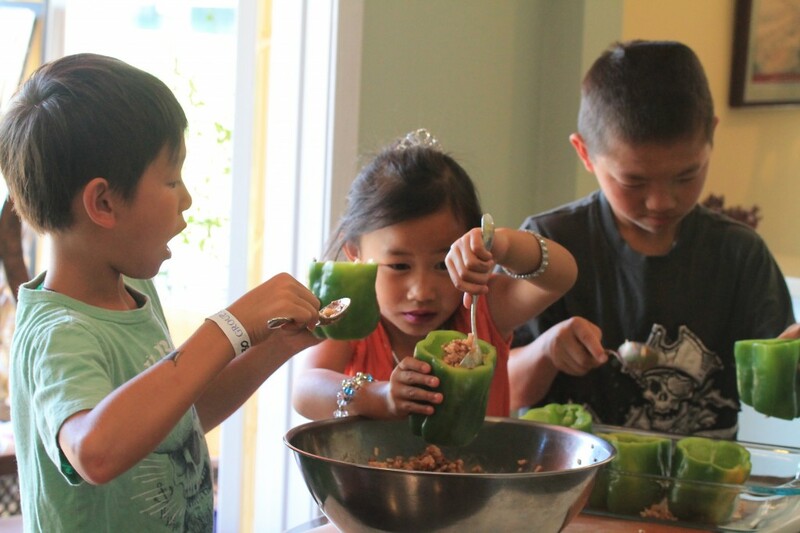 Now of course, these Stuffed Green Garden Peppers are delicious for adults to prepare and enjoy too. 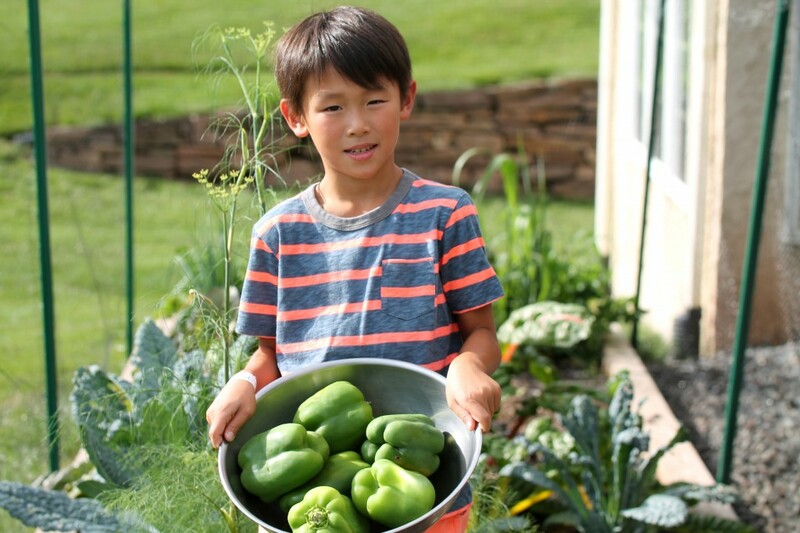 And with a bounty of green peppers, they may also be frozen for later use. 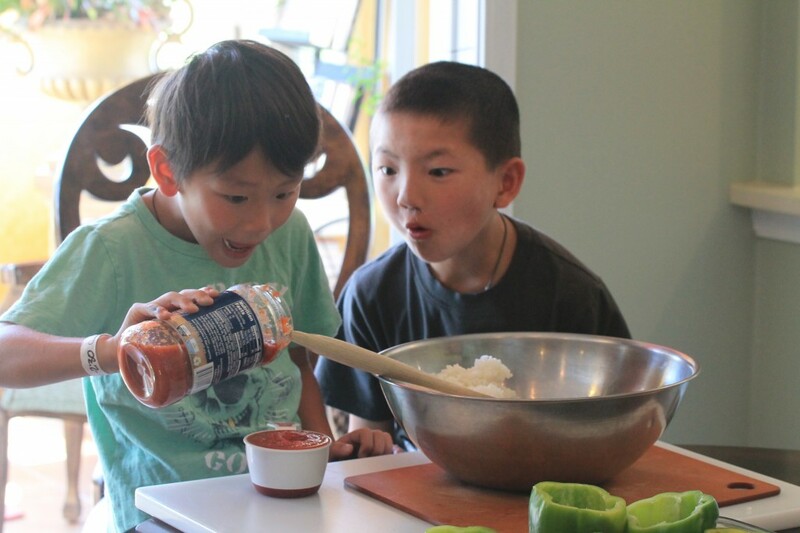 Is this fascination with the tomato sauce, or, measuring so as not not overflow the cup? 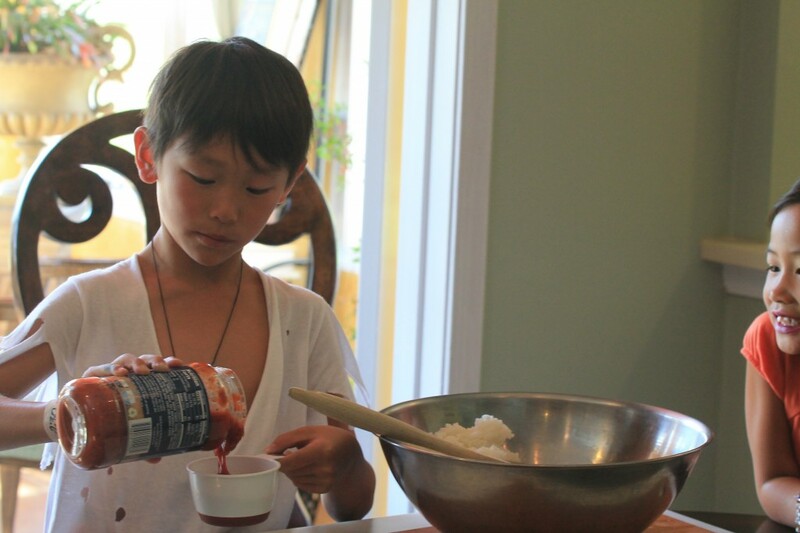 It does take good arm muscles to stir all the ingredients together well. And focused concentration filling those bright green cups. Finishing off by carefully pouring the remaining sauce over the ready stuffed green peppers. 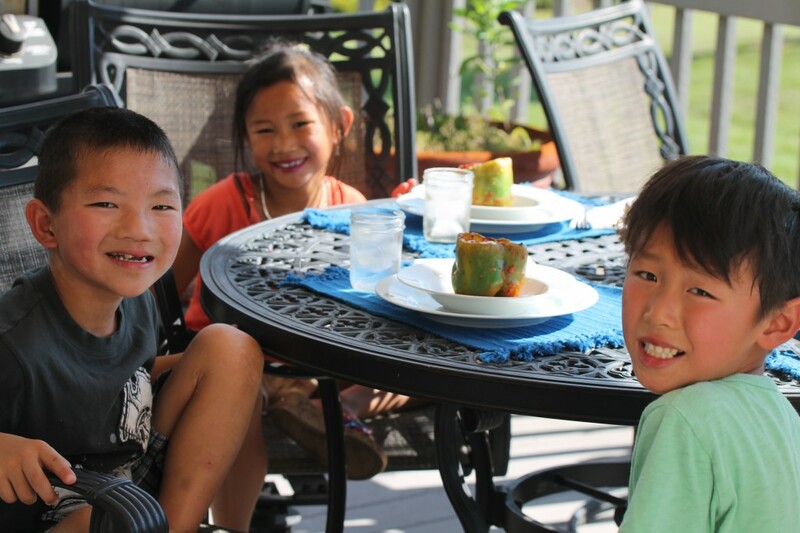 And later, enjoying a backyard picnic earned through good work, well done. 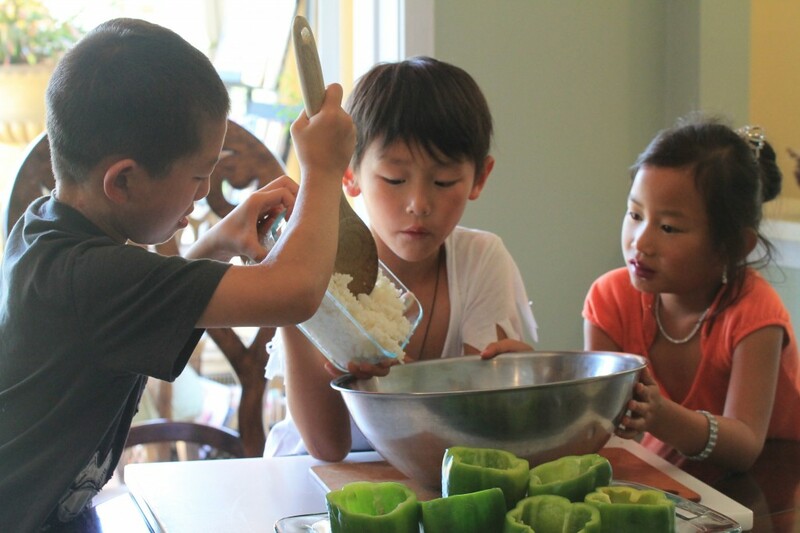 Happy moments, and a learning lesson on how to prepare Stuffed Green Garden Peppers, part of the summer bounty, and a special joy that comes from Cooking with Kids, Stuffed Green Garden Peppers. 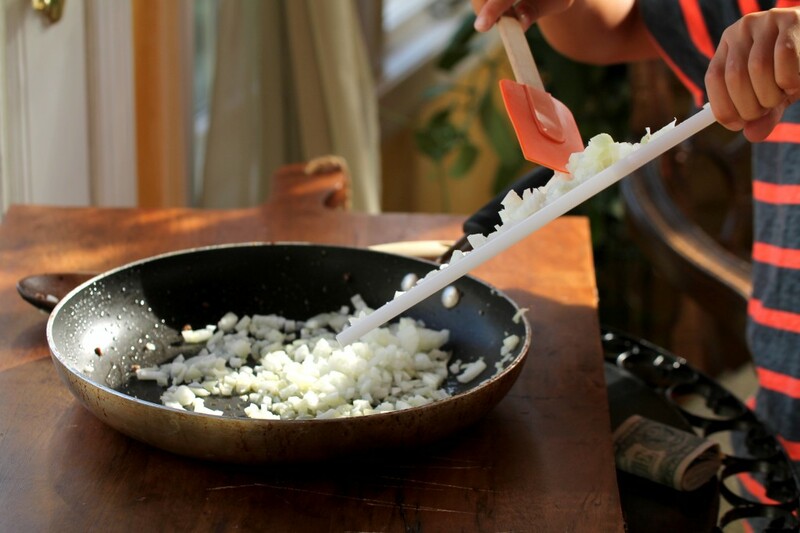 Scrape onions into a large saute pan with 2-3 tablespoons olive oil. Cook onions on very low heat until translucent about five minutes. Add ground beef to the onion, stir, cooking ground beef until no longer pink throughout, approximately ten to twelve minutes. Season ground beef mixture with salt and pepper. Cook rice according to package instructions. Both the ground beef and rice may be cooked one day in advance and chilled in separate containers if desired. Preheat oven to 350 degrees. Wash and dry green peppers. Cut a small amount off of the bottom of each pepper so it sits squarely. 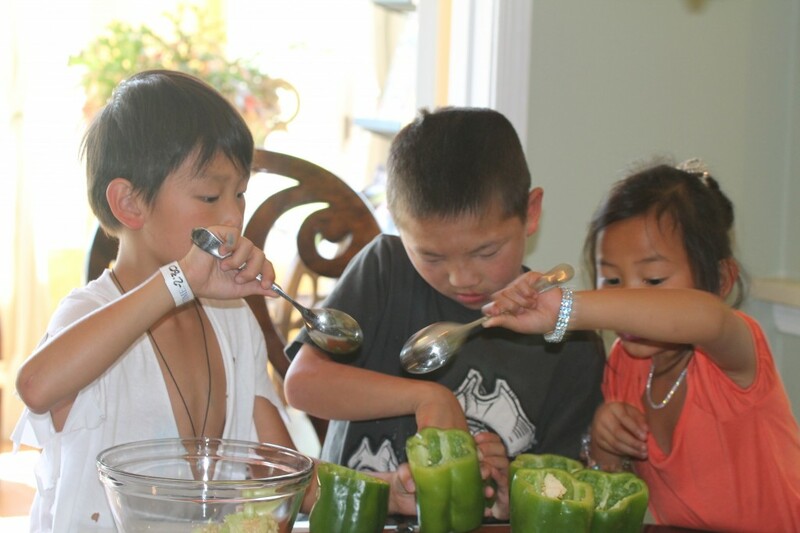 Cut about a half inch off the top of the green pepper and using a knife, cut the attached pith all the way around the top inside so that the seed and pith can easily be removed by a child using a spoon. In a large mixing bowl stir together well the cooked ground beef mixture with the rice and one cup of the tomato sauce. Spoon the mixture into the cored green peppers then place into a large glass casserole dish. 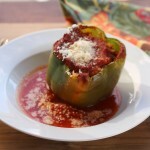 Once all of the peppers are stuffed, pour the remaining tomato sauce into the bottom of the dish all around the peppers. 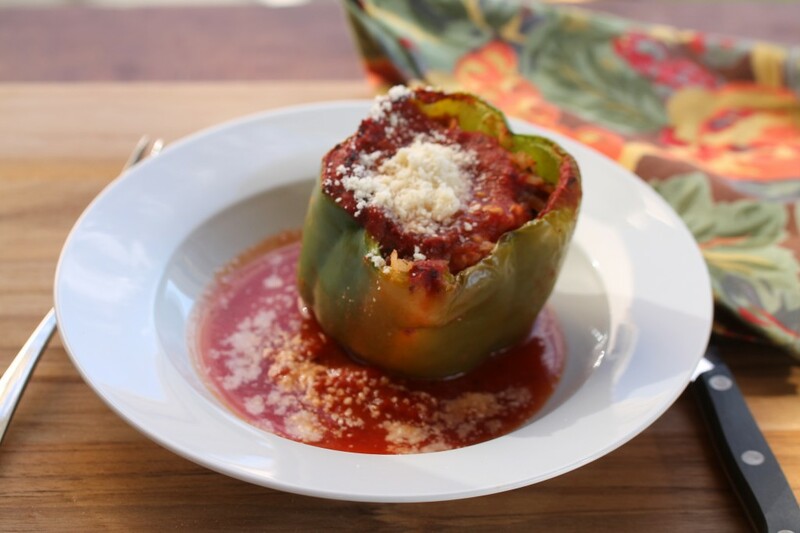 Cover stuffed peppers with aluminum foil and place dish onto a baking sheet. Cook peppers until softened about forty minutes, remove the aluminum foil and cook another ten minutes. 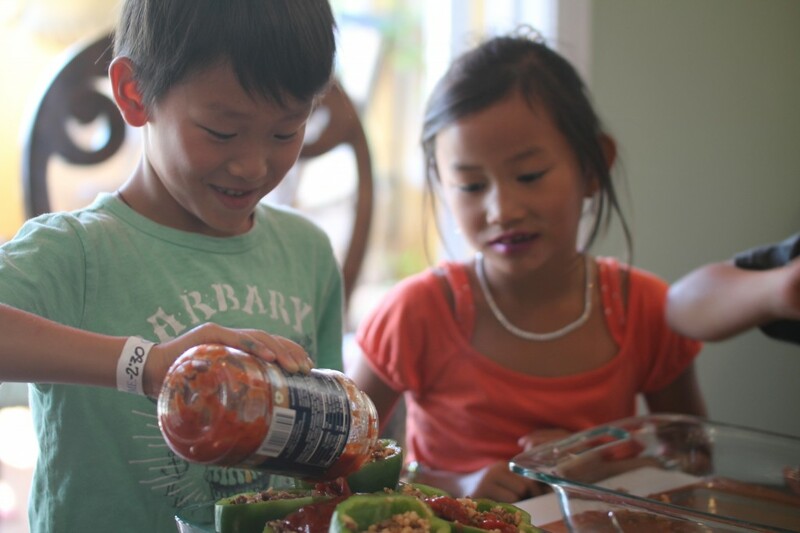 This entry was posted in Cooking With Kids, Meats, Veggies and tagged Cooking with Kids, Stuffed Green Garden Peppers, Stuffed Peppers. Bookmark the permalink. Post a comment or leave a trackback: Trackback URL.